Below is a brief apple maturity report (I want it to be over too) and the remainder of this Healthy Fruit is dedicated to a rather informal discussion/observation on what we saw as pest management issues, or in some cases non-issues, in 2016. 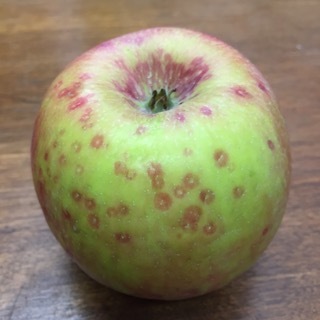 Apple scab -- there were 7 primary apple scab infection periods according to NEWA (http://newa.cornell.edu) at the UMass Orchard with 100% ascospore maturity occurring on 23-May. Research at UMass suggests that ascospore maturity was delayed beyond 23-May, and there was one additional primary infection event in early June. 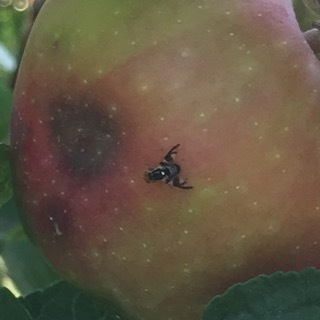 Of course every orchard across Massachusetts is different in the progress of scab biology because of location, disease pressure and precipitation. Scab was quite manageable by most, however, an exception or two was noted. In addition to the apple scab model being available on 48 NEWA sites in Massachusetts, there were 4 RIMpro (http://www.rimpro.eu/) sites using either NEWA weather data or Meteoblue, plus 9 experimental RIMpro sites using HRDPS. There were also 6 AgRadar (http://agradar.info) locations available. All DSS’s (Decision Support Systems) provide valuable IPM decision support through the use of apple scab, fire blight and insect models, among others. Fire blight -- while bloom was a long, drawn out affair for most of the state, drought conditions prevailed through most of this time creating conditions that were not particularly favorable for FB, except very late in the bloom period. Some strikes were found here and there, but seriously a pretty much a “no-show” in 2016. Orchards with a previous recent history of fire blight saw more strikes. That does not mean we can let down our guard: remove cankers during winter pruning as much as possible, spring copper at high rate, streptomycin during bloom based on model risk, low rates of copper and biological (Cueva and Double Nickel among others), and summer strike removal during dry spells. FB will be back in force we are afraid one of these years, largely a consequence of earlier bloom combined with warmer early spring temperatures. BAD things happen when primary scab is not controlled -- but we all know that, right? Rust diseases -- Cedar apple rust lesions were prevalent on foliage in orchards where fungicide management was not sufficient to arrest this disease; fortunately, there was little fruit infection. Just a reminder to include fungicides effective against rust diseases when spraying for scab pre- and post-bloom. Varieties differ greatly in susceptibility. This is generally not a problem in well-managed commercial orchards. Summer diseases -- sooty blotch/fly speck/fruit rots were definitively hampered by the dry weather in late summer. Really not much news to report here, we suspect minimal summer fungicide sprays were necessary. Golden Delicious trees in one orchard were seriously afflicted by necrotic leaf spot/Glomorella? 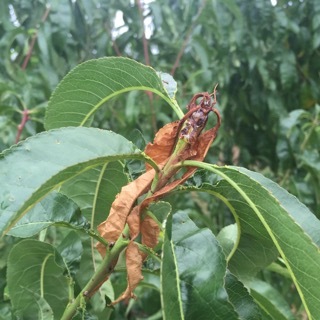 Peach leaf curl -- With a total crop loss throughout the entire state, not many people were thinking about pesticide applications in peaches this year. As a result peach leaf curl was seen in several orchards. Once the symptoms appeared, it was, of course, to late to treat. Copper applications between leaf fall and bud break should be made to get this disease back under control for next year. 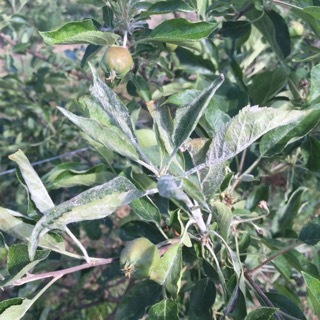 Powdery mildew -- not a bad year, although some was certainly observed (in Honeycrisp in particular); growers need to be sure to include a PM-effective fungicide (SDHI’s in particular, or sulfur) every year beginning at pink bud stage. San Jose scale -- we are seeing ongoing issues with SJS. Softer insecticide use (aka Assail) may be contributing to this and/or warmer winters. (Or a decline in spring oil/Lorsban applications.) Aggressive management, including a good dose of spring oil (with or without Lorsban, depending on your inclinations), and effective insecticides such as Esteem, Centaur, and Movento/Sivanto will diminish the impact of scale in your orchard, however, we expect ongoing problems. Note that timing of insecticide application is critical for effective management of scale. 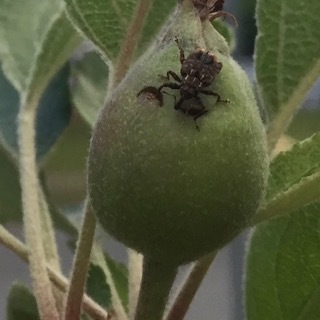 Plum curculio on apple fruitlet; this is BAD, but we all know that, right? 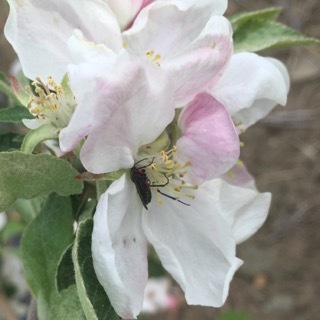 European apple sawfly -- Yet another one of those pests that is usually well managed by a petal fall (or pre-bloom) spray that was dicey to get on this year due to the prolonged bloom period. More damage was seen from EAS this year than in those recently past. 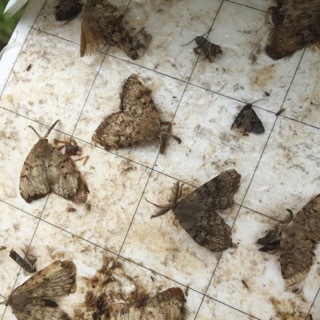 Lepidoptera moths/worms -- despite significant pheromone trap catches, little damage observed from these worms. Growers are effectively controlling these leps either with targeted sprays (of Delegate, or Altacor among others) where a known, historical problem exists or they are still being effectively controlled by insecticides (Imidan, Assail) targeting other pests (like plum curculio). 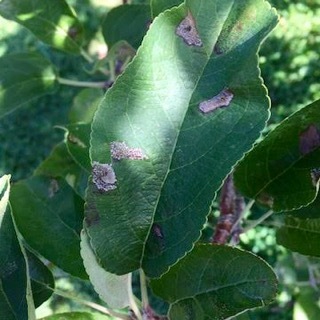 The lack of a peach crop made Oriental Fruit Moth control less urgent, but late-season tip injury to peach trees was noted. (Although no shoot tip invasion was to be found earlier in the year.) Just in -- reports of either codling moth or Oriental fruit moth damage to harvested fruit are increasing. It's pretty hard to tell the difference between CM and OFM damage, but I am suspecting OFM because they did not have peaches to get into. Mites -- dry weather favored mites, most likely both European red mite (ERM) and two spotted spider mite (TSSM). 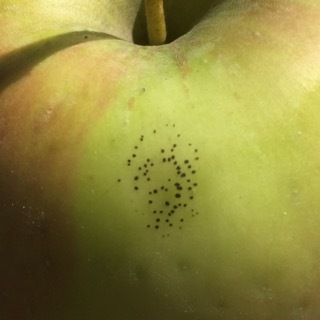 Spot or whole orchard treatments with miticides became necessary, however, with some control failures. One report of significant damage to pear foliage by TSSM. 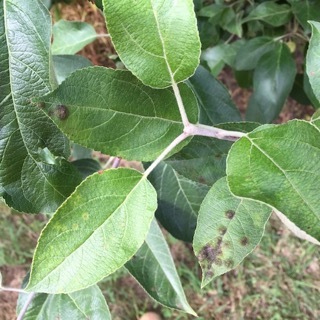 Rust mites on apple foliage were also documented in late July, they may be an under-rated problem on some susceptible varieties, however, generally don't warrant treatment. Mites were a much bigger problem this year than in previous (wetter) years, so spring oil application needs to be seriously considered in 2017. Gypsy moth -- caterpillars were observed in young trees and treatment was needed; by late-summer, gypsy moth adults were being caught in pheromone traps (for other moths) in at least one orchard, however, no damage reported; anecdotal report of complete defoliation of small/organic orchard in south-central MA by GM; young plantings, which are often not sprayed with insecticide, will need to be monitored in 2017 if GM has another banner year. 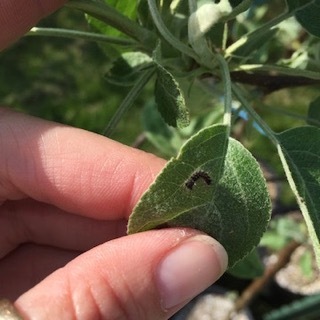 Spotted tentiform leafminer -- only a problem in a few orchards, however, letting it get out of hand can cause pre-harvest drop and some tree health issues. Monitor flight(s) beginning in April, and treat the sap-feeding mines with effective insecticide(s) applied according to degree-day model and scouting for mines. Foliar urea applications and leaf chopping will go a long way to reducing the pupae overwintering in orchard leaf litter. 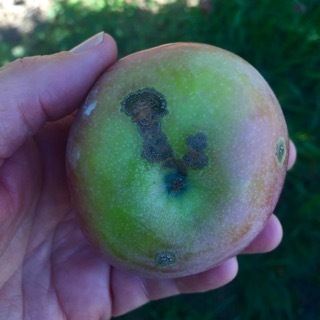 Apple maggot fly -- surprisingly heavy pressure given the dry weather. Still generally easily controlled. A Delicious tree near an abandoned orchard was really hammered. Growers are advised to monitor AMF populations through the use of sticky traps to ascertain if and when treatment is necessary. The trap threshold for AMF is an average of one fly per trap where no attractant is used and five flies per trap where bait is used. 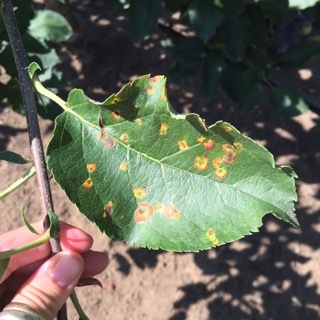 Pear psylla -- we have had to become better managers of this pest where pear growers continue to have issues. Spring and summer oil applications are your best friend here, followed by applications of Centaur, Movento/Sivanto, etc. Conventional insecticide resistance is likely, and many generations/overlapping life stages makes pear psylla a tough one to master. Aggressive management, use of effective insecticides (lead by oil), and timeliness of insecticide applications are the only effective approach, but well worth it to clean up this sticky (literally) situation. 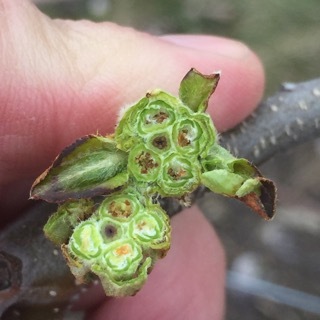 April freeze -- which occured at early green tip clearly damaged flower buds, resulting in significant variability in bloom, fruit set, and crop load largely depending on location; some orchards ended up with a very minimal crop whereas some were close to “average.” Keep in mind a lighter crop was likely in 2016 following a heavy apple crop in 2015. 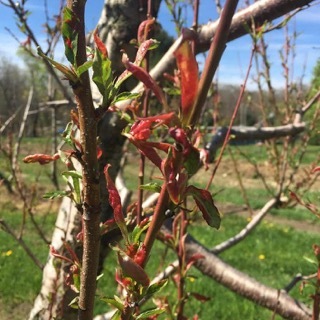 Bloom was extended and flower buds were showing crinkled spur leaves and flower petals, thus significant damage; somewhat surprisingly, fruit set was remarkably good for some varieties like Honeycrisp and Macoun, whereas some McIntosh blocks appeared to be in trouble. 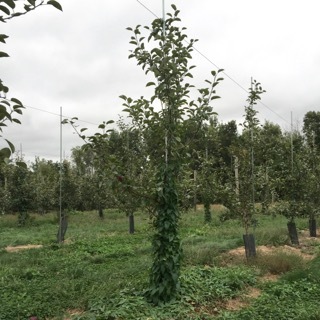 A pretty much non-aggressive approach to chemical thinning was common, however, in retrospect it would have been advised to do more chemical thinning as fruit was clustered and in some cases heavily set; hand thinning was necessary, but not always done. Weeds -- maintaining effective weed management throughout the growing season is a critical piece to keeping your orchard healthy. A weed free strip in row and well mowed aisles will not only reduce competition between weeds and crop plants but will reduce safe harbors for voles and many insect pests. This practice can also help reduce pesticide exposure for pollinators, provided weeds are prevented from blooming in the orchard when insecticide sprays are made. Needless to say, this is not a particularly good situation; growers have a tendency to ignore weed control because other things are (arguably) deemed more important, but we need to up our game on this one by using a combination of residual and contact herbicides applied in fall and spring! Drought -- at this point in the season, just over 50% of Massachusetts is in a state of extreme drought (90% in severe drought). Compared to the precipitation average of the last five years in Belchertown, as of September 28, we are down about 10” of rain this year. This has caused many issues in the orchard from weeds that are less susceptible to herbicides to uneven fruit sizing. Short of beefing up your irrigation systems (and maybe a rain dance) there is not much that can be done about this. Well, except the fact Massachusetts has been declared a primary disaster area because of the drought by USDA and there are numerous state and federal low/no interest loan programs available to farmers who need financial assistance. (Let us know if you have trouble finding those programs.) Are we tired of talking about it yet? This is the last official Healthy Fruit of the 2016. As always feel free to get in touch with any member of the UMass Fruit Team (http://extension.umass.edu/fruitadvisor/team-members) if you have questions or comments. Hope to see you again next season, and let's hope for a less weather-challenged one!